In the article the author points out a number of things about immigrant voting in the U.S., likening her comment to that of the “grandfather clause” and pointing out that the Trump family would be incapable of voting in this election if this were, in fact, a rule. Anyway, it’s an entertaining read if you have the time. However, what struck me upon seeing my friend’s FB post is that, if this were the case, I would be prohibited from voting. My maternal grandmother was from St. John’s, Newfoundland (that’s in Canada). She married my maternal grandfather, an Alabamian, making her a 1st generation immigrant. My mother and her brothers, who grew up in Alabama and abroad because my grandfather was in the Air Force, are then 2nd generation immigrants. And my mother, after graduating from high school in Montgomery, Alabama, married my father, and eventually they had me, a 3rd generation immigrant. I read this tweet it dawned on me, for the first time at the age of 25, that I’m a 3rd generation immigrant. So, I guess I find myself having to thank Ann Coulter for making me check my own white privilege. Growing up white and middle class in Alabama, I wasn’t subjected to marginalization or discrimination (gender aside). Unlike the woman in the video below, my Americanness went entirely unquestioned. Not just for others but for me as well. I never experienced the extensive heritage-deciphering questions because I looked the part. I’ve long known that my maternal grandmother was Canadian (or a Newfie, depending on where you are), but it never once occurred to me that that made me any less American. Even when I told people about this, no one ever labeled me as an immigrant or non-native (my nativeness is a whole different post for another time perhaps) only to then probe my heritage so to determine my legitimacy as an American. My whiteness — like that of many 2nd and 3rd gen immigrants, I’m sure — has allowed me to exist quite easily as an unnoticed or invisible immigrant. That’s to say that no one asks me where I’m really from. 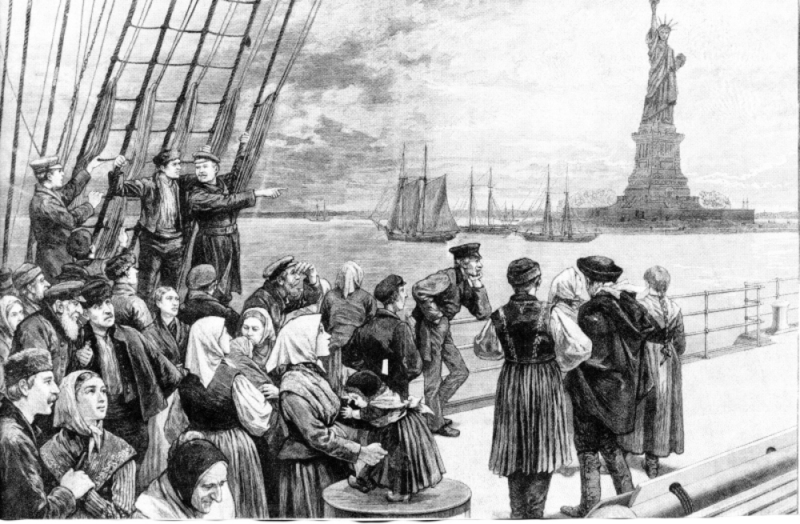 Keeping in mind that the U.S. is and continues to be a nation of immigrants, we must then reconsider recent discourses on immigration. When is immigrant status noticed? When is it accepted? When is it feared? While one can easily start a heated debate on undocumented immigrants, I would ask that we take a moment to really consider the conversations being had. Growing up in Alabama, I’m all too familiar with conversations regarding immigration, and like the WaPo article condemning Ann Coulter, I suspect that these conversations have far more to do with race and class than immigration. As for me, my whiteness protected me from the marginalization that many experience, even to the extent that it made me totally unaware that I was even an immigrant at all. But thanks to Ann Coulter, I now see and will check yet another aspect of my own white privilege. So I’m Andie, and I’m an immigrant. And yes, Ann, I did vote. This entry was posted in Grad Blog, Relevance of Humanities, Religion in Culture and tagged american, Andie Alexander, Ann Coulter, Canada, Election Day, Identity, Identity Construction, Immigration, National Identity, Newfoundland and Labrador, Race, United States, White Privilege by Andie Alexander. Bookmark the permalink.